Be careful not to scratch or damage the door mirror body when removing. Disconnect door mirror harness connector. Remove door mirror nuts and the door mirror assembly. Put a strip of protective tape (A) on housing assembly. Insert a suitable tool (a) into the recess at lower side between glass mirror (1) and actuator (2), and push up pawls to remove glass mirror lower side in the order shown. Insert a suitable tool at (LH and RH) side between glass mirror and actuator, and push up pawls to remove glass mirror (LH and RH) side. Disconnect door glass mirror heater harness connectors (if equipped). After installation, visually check that pawls are securely engaged. With side turn signal lamp shown, without is similar. Remove door glass mirror. Refer to mir-18, "glass mirror : removal and installation". 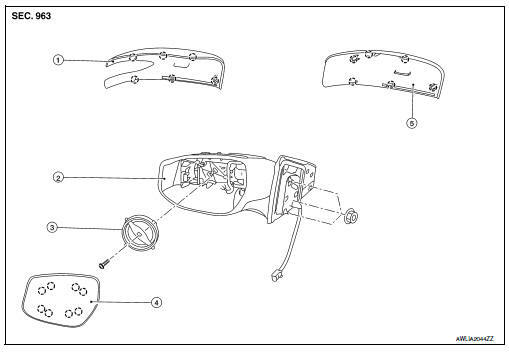 Using a suitable tool, disengage door mirror cover pawls to separate the door mirror cover (1) from the door mirror assembly (2).